Morbid Obesity is the leading public health epidemic of the industrialized world with bariatric surgery as the only effective and enduring treatment for this disease. Gastric Bypass is known to be very effective for weight loss but can have complications like marginal ulcers or strictures. We hypothesized that gastric bypass patients with ulcers/strictures have differing demographics and outcomes. From 2005-8 at an academic center, 500 patients underwent laparoscopic roux en y gastric bypass by a single surgeon who employed a 25mm EEA stapled gastro-jejenostomy technique. One year follow-up was 82% and marginal ulcers/strictures were identified in 17 patients (3.4%) in a prospectively maintained database. Study patients were 82% female with an average age of 43 and BMI of 49. 3.4% of patients had marginal ulcers and/or strictures as determined by endoscopy. There were no preoperative demographic differences between patients who did or did not have ulcers/strictures. At one year post-operatively, patients with ulcers/strictures had less improvement in CRP (45% vs. 75%) but significantly increased percent excess weight loss (98 vs. 78, %). 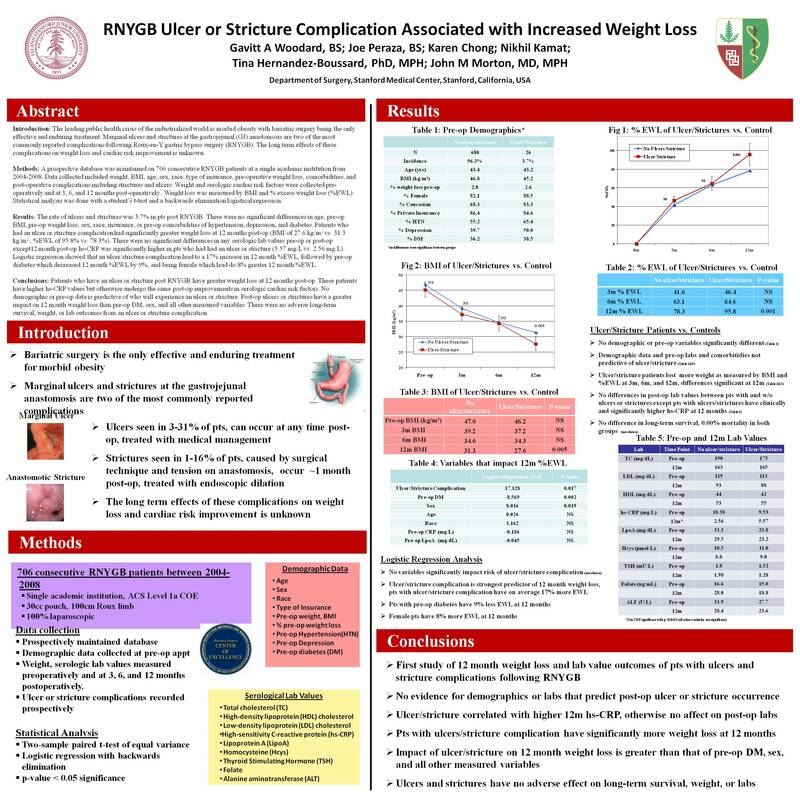 In this large cohort, marginal ulcers and strictures in the post gastric bypass patient leads to significantly increased weight loss. This finding may lend credence to the use of endoscopic stoma reduction. in gastric bypass patients who have had poor post-operative weight loss.